CHICAGO - Oct. 21, 2017 - PRLog -- The Lashe would like to thank you for being a valued customer. Enjoy 10% off your Complete Order! Our line was born to satisfy unmet needs. We heard the outcry for premium products, precision techniques and superior craftsmanship from all practitioners. For countless months we designed and redesigned, formulated and reformulated, tested and retested. Our goal was to develop the best product repertoire as well as the best-in-class technique for our clients. As good as our products are in their own right, what really brings out their built-in features is our technique. The Lashe® technique and The Lashe® products are complementary by design and in a way they are inseparable. If you like our products, you will love our training. Our intensive, hands-on training courses were designed to be the most comprehensive training available. Our courses teach the technical skills, design elements, innovation and artistry of seamless eyelash extension applications. And, they are continually updated. We now have the most complete, safe and high quality professional line available. Enjoy it! 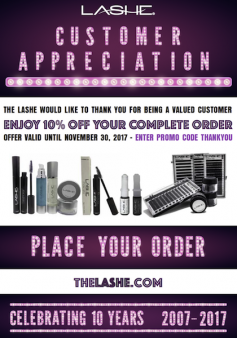 If you are a Stylist looking for Professional Products, you will need to complete the following two steps: Create an Account https://www.thelashe.com/LOGN.html Email us a photo of your Certification/License to: TheLashe@thelashe.com If you are a consumer looking to purchase products, creating an account is optional.